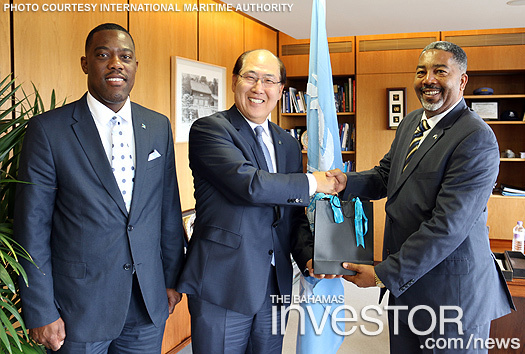 Frankie Campbell, Minister of Transport and Local Government of The Bahamas, paid a courtesy call on Kitack Lim, Secretary-General of the International Maritime Organization (IMO), 14 July, 2017 at the IMO Headquarters in London, UK. The Minister was accompanied by Eldred Bethel, High Commissioner and Permanent Representative of The Bahamas to the IMO, Don Saunders, Deputy Speaker of the House of Assembly, Commodore Davy Rolle, CEO and managing director of The Bahamas Maritime Authority and Bernis Pinder, maritime liaison, Bahamas High Commission, London. During the courtesy call the Secretary-General congratulated Minister Campbell on his appointment as Minister of Transport and Local Government. The Minister provided the Secretary-General with an update on the work his Ministry is undertaking, the Maritime Cadets programme for High School students between grades 10-12, and the LJM Maritime Academy. 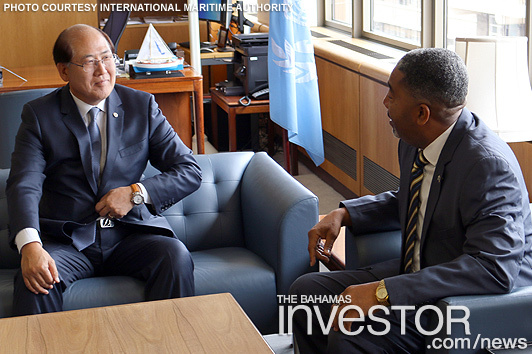 The Bahamas is currently seeking re-election to the Council of the International Maritime Organization under category C. The Bahamas is the sixth largest contributor to the IMO budget. The Bahamas remains the flag of choice for passenger ships. The Minister was in London to participate in the 44th anniversary of independence events hosted by the High Commissioner and to assist with the campaign for re-election to the IMO Council. A maritime attorney with a local law firm says The Bahamas is only steps away from regaining its position as one of the world’s most respected and sought after shipping registries. Preliminary evidence suggests that domestic economic activity remained mildly positive during the month of June, as output in the construction sector continued to be buoyed by foreign investment projects. Read a report from the Central Bank of The Bahamas here.